Jane Blundell Artist: Black Sketch Books 1 - Moleskine Watercolour Notebooks. Black Sketch Books 1 - Moleskine Watercolour Notebooks. 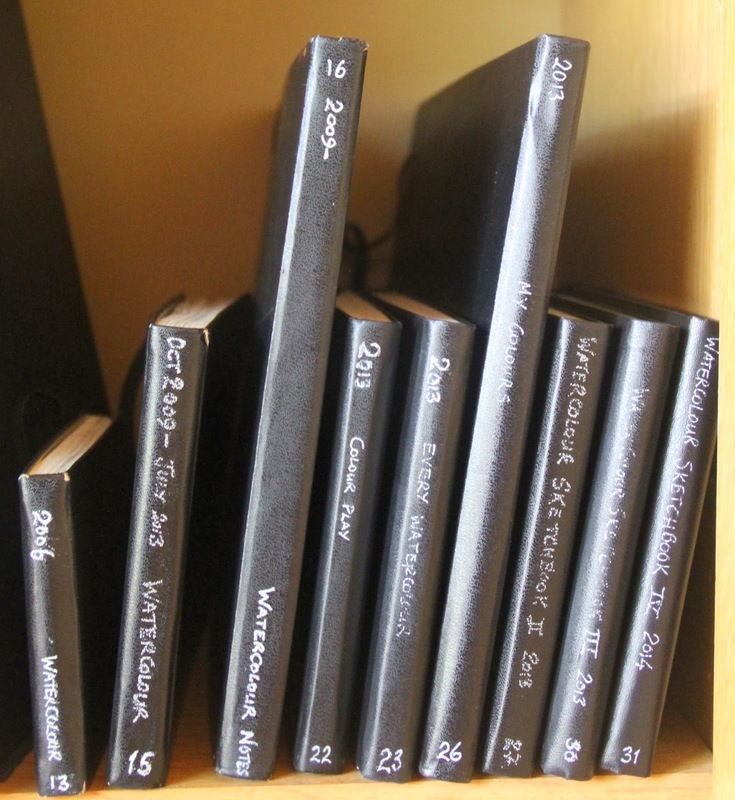 I have a large number of black books that I have used over the last 30 years as sketch books, visual diaries, note books, study notes and so on. I have some other books that are not black - beautiful leather bound books and so on - but I'll concentrate on the black books for now! 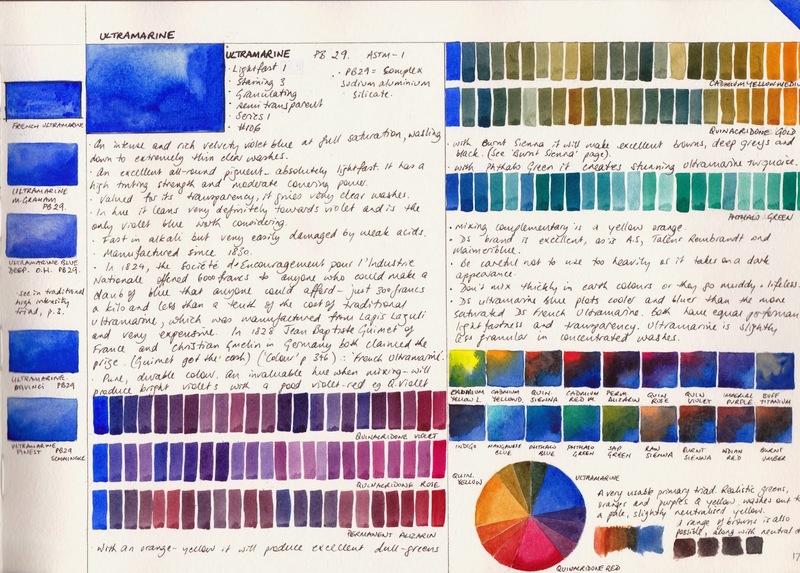 This first post is on the Moleskine Watercolour Notebooks. Future posts will cover Stillman & Birn, Handbook, Canson and others I have tried over the years. My collection of black books jumbled onto one shelf. on left. The others are 5 of the 'large' and two of the 'folio'. 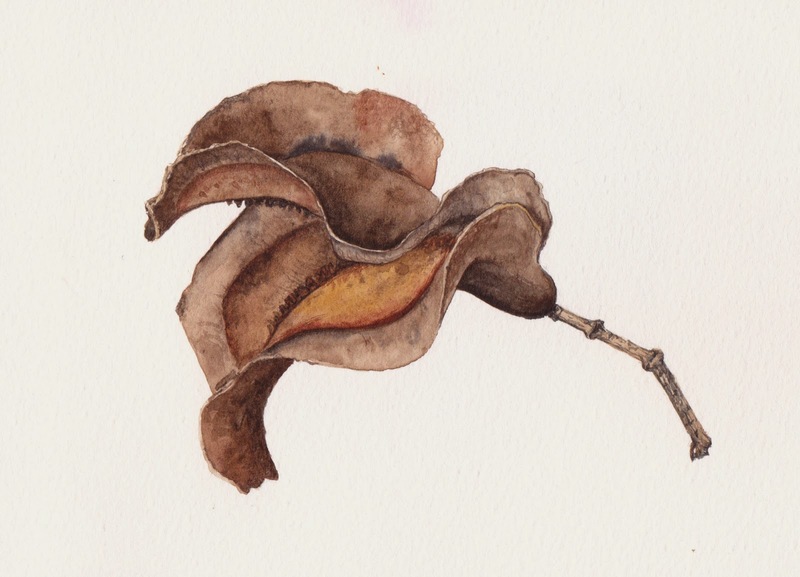 Of all the sketchbooks I have tried, my favourite for painting are the Moleskine Watercolour Notebooks. These are made with 200gsm cold-pressed white watercolour paper that is designed to be the same surface on both sides. It is also thick enough to take paint on both sides and takes watercolour washes well. Being cold pressed it is not completely smooth but is also nice to use for pen and ink and pencil drawing. The Moleskine watercolour notebooks come in landscape format in Pocket (A6), Large (A5), Folio Album (A4) and a larger Folio Album (A3). You can see them all here. They all have an elastic closure, which is helpful if the book is rattling around in a bag, and a pocket for extra papers or notes in the back, features that have been copied extensively in recent years. I have had a pocket version, on the left of the picture, since 2006, and it is a lovely little watercolour book but I prefer to carry a the larger A5 book with me these days, along with a Stillman & Birn Alpha Pocket notebook, which I'll show you in part 2. The Large Moleskine Watercolour Notebook from the Moleskine.com website. I really like the landscape format of these books. For plein air sketching it allows you to do a very wide view across the page if you wish, or turn the book vertically for an alternate view. 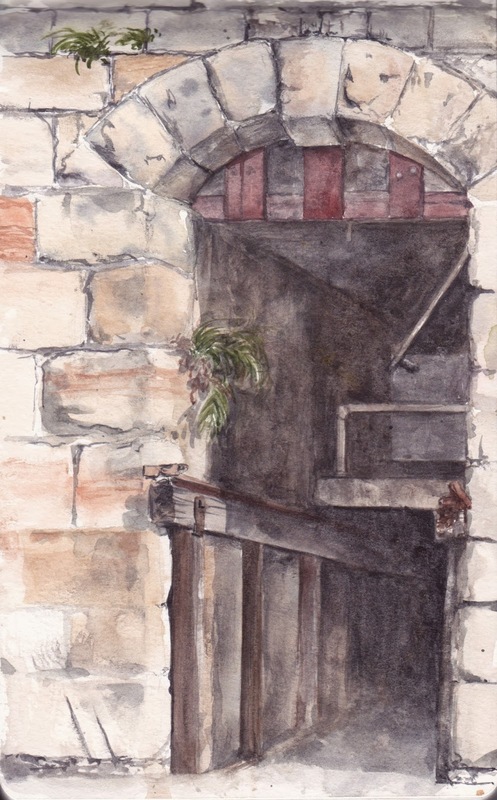 The images below are all from an A5 'large watercolour sketchbook' as pictured above, which is 81/4' x 5" or 21cm x 13cm. You can see many more of my sketches on my website here. A great size for plein air and my absolute favourite sketch book. Large watercolour sketchbook used horizontally. Large watercolour sketchbook with image extended partially across the page. I am up to my 4th Large Notebook for plein air sketching, but have two others that I use for documentation. One I have called 'Every Watercolour', which has a painted swatch of every watercolour I have tried. They are arranged by colour type, lemon yellows together, deep blues etc, with details of colour name, brand and pigments used. Here is one of the cool blues pages. They are painted quite close together to waste as little space as possible but are also done with plenty of water at the top to show the full tonal range and characteristics of each colour. 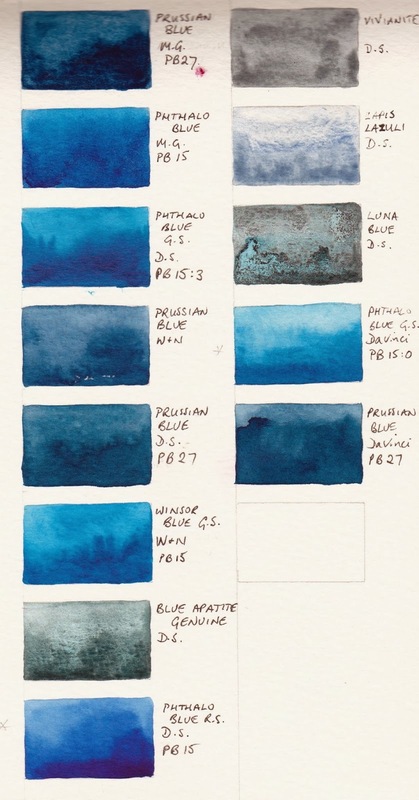 'Every Watercolour' sketchbook - one of the cool blues pages. My other Large Watercolour Notebook has a whole range of mixing experiments and triad work. It is very helpful to keep these in one well organised spot rather than to do them on a rough piece of paper and throw them away. They can then be referred to later and are very useful for my teaching. Here are a couple of sample pages. A colour wheel using opaque earth colours. On the right are other compatible colours. My A4 Folio Album books are also for my own reference notes. 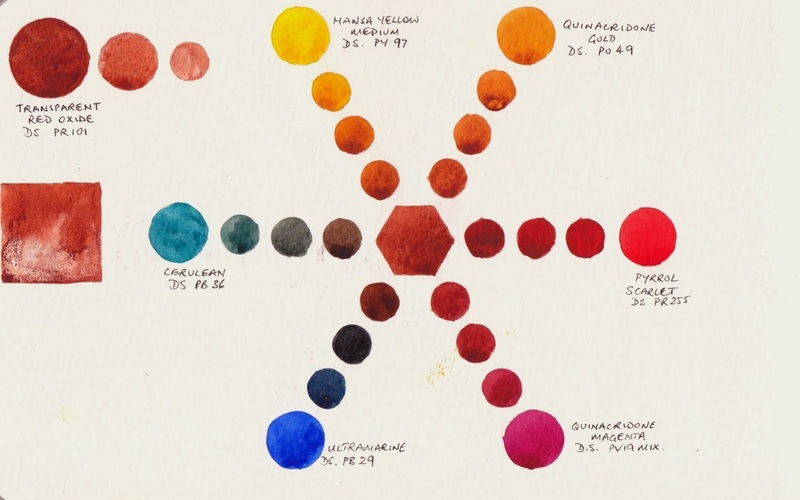 One contains a paint-out and research information, mixing experiments and pigment history of every Daniel Smith watercolour. Below is my page on Ultramarine. Ultramarine, page from my Moleskine Watercolour Folio on Daniel Smith watercolours. In the left margin are other Ultramarine paints by other manufacturers for comparison. Coming up next - Stillman & Birn. 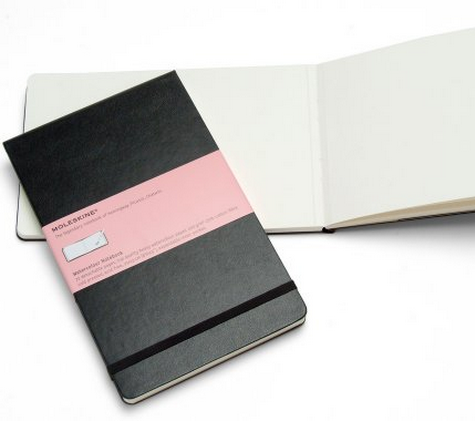 Stillman & Birn are certainly whiter than Moleskine, yes. Can I ask, what do you use to write on the spines of these books? Is it a white chinagraph pencil? Thank-you. I use a white Uniball Signo pen. The number on it is UM-120AC if that's any help. There are two versions of the uniball white pen that I am aware of - this is the thinner bodied version. It works pretty reliably. Not all white pans are reliable. It's also useful for adding white highlights or details to a sketch, should you need to.